Zoo Knoxville had to close for 10 days after their transformer was flooded in February. KNOXVILLE, Tenn. — After being closed for 10 days due to flooding in February, Zoo Knoxville has announced the money they lost during that time has been completely restored. The heavy rain a couple of months ago brought a flood of worry and expenses to Zoo Knoxville, according to marketing communications director Tina Rolen. "That was obviously concerning for us and something that we were concerned about how that would impact us as we got into our spring season," Rolen said. However, the saving grace for the zoo was Spring Break and community support. "Over the Spring Break calendar, we had visitors coming out in mass and they closed that gap for us," Rolen said. "So we are very appreciative of the love and support that East Tennessee gave us." That gap was caused when the zoo's transformer was underwater. They brought in generators, which cost about $30,000 a week to operate, and the zoo had to close for 10 days, which equaled about a $100,000 loss in visitor spending. In all, the zoo estimates to have lost about $350-450 thousand. "Hopefully, we won't ever see flooding on that scale again, but if so, we're going to do our best to be prepared so we can continue uninterrupted," Rolen said. For Zoo Knoxville, being prepared means running severe weather drills for staff, animals and guests. This all comes with being an accredited zoo and wanting to make sure everyone is safe in an emergency. This isn't the only hardship Zoo Knoxville has faced in the last few years, though. In 2017, 33 reptiles were found dead in the reptile habitat from an unknown agent. However, with the announcement of the new 'Clayton Family Amphibian and Reptile Conservation Campus (ARCC),' the number of reptiles will be restored fully and then some. "One of the things that came out of that terrible tragedy was this new ARCC facility," Rolen said. "The community once again rallied and said we want to help." 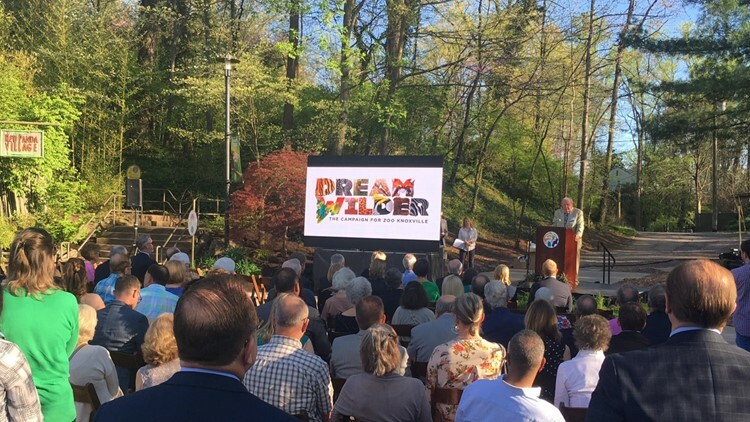 Overall, the community and animals are at the forefront and the sky's the limit for Zoo Knoxville. "We're so excited what this is going to open up and allow us to accomplish," Rolen said after speaking about the new ARCC facility to be debuted in 2021. Zoo Knoxville is a leader in helping endangered species from all over the world. They hope the new facility will allow the public to see and experience that effort fully and interactively.